Augmented reality gaming; Spatial augmented reality gaming; Virtual reality entertainment; Virtual reality gaming. 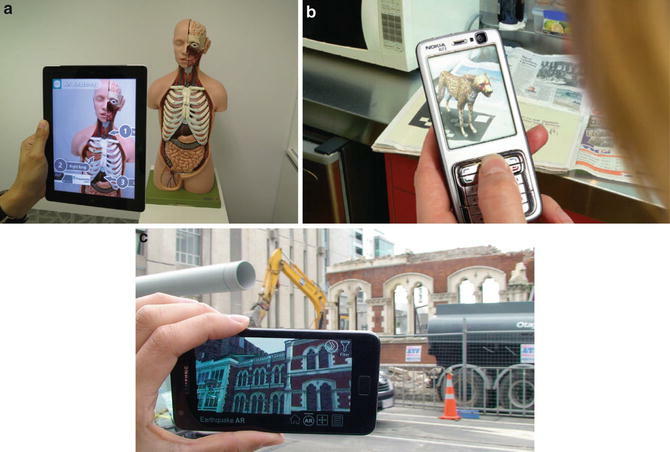 Augmented reality (AR) is technology that seamlessly adds virtual imagery over a view of the real world, so that it can be seen and interacted with in real time. Azuma says that an AR system is one that has three key defining characteristics (Sutherland 1968): (1) It combines real and virtual content, (2) It is interactive in real time, and (3) It is registered in 3D. AR can be used in many possible application domains, such as in medicine to show virtual anatomical structures in a real patient’s body (Fig. 1a), marketing where computer graphics appear to pop out of a magazine (Fig. 1b), and architecture where unbuilt virtual buildings can appear in the real world (Fig. 1c).